Miyajima Laboratory is an exceptional company, founded and led by Noriyuki Miyajima – music and good sound lover, a man active in audio for years. First, as a hobbyist, he followed the development of technology and everything related to it, later he started sales of audio equipment to finally concentrate on the manufacture of phono cartridges and peripheries. This company was present only due individual purchases from aesthetes and music lovers (as the product is aimed at that client – more about that later). But lately a new distributor appeared, which decided to represent this company in Poland. T-Pro is the name of the company, which is in fact a manufacturer, a new brand on the market, although the man behind the company – Robert Rolof – is far from being a novice: he was the one to design the phono preamplifier RCM Audio Sensor Prelude IC, which I am using for three years now. So he knows the one and the other about turntables… Using his knowledge, I asked him to write a series of short articles about adjusting cartridges, etc, which – I hope – we will be publishing shortly. The information below is also prepared by him, helped by the miyajima.pl web page, which he also prepared. Like we said, Mr. Miyajima is most of all a music lover. In the company materials he writes: “…Staring from just a fan of music as my hobby, I have been running a dealer of audio related products, and now I have become MANUFACTURER. As much I have been interested in audio history and technologies, as less I have been satisfied with the existing products. Moreover, I have felt uncomfortable that we have not endevored to succeed such favorable audio technologies obtained by tremendous efforts of our frontiers in this field…” So he decided to construct devices, that would fulfill his demands. His choice was the cartridge, as according to him, that is the most important element in the analog audio chain. Analyzing most constructions he came to the conclusion, that none of the cartridges available on the market allows for optimal contact between the diamond and the groove. He concentrated his research around that, and in 2002 he patented his own construction of a mono cartridge, and in 2005 a stereo cartridge. In both cases, the employed solutions increase tracking precision and the contact with the groove. 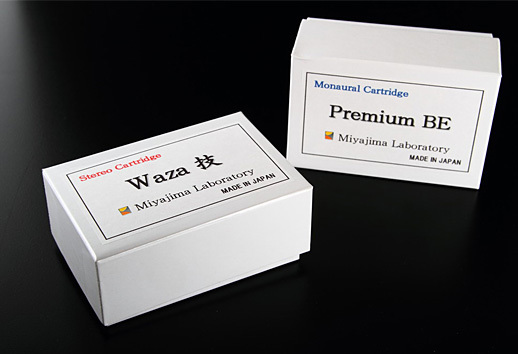 The main goal of a cartridge is to transform mechanical movement into electric current. This is done by induction, by placing a coil in a magnetic field. One of the elements influencing the quality of the signal generated that way, is the mechanical connection between the moving elements and the cartridge body. 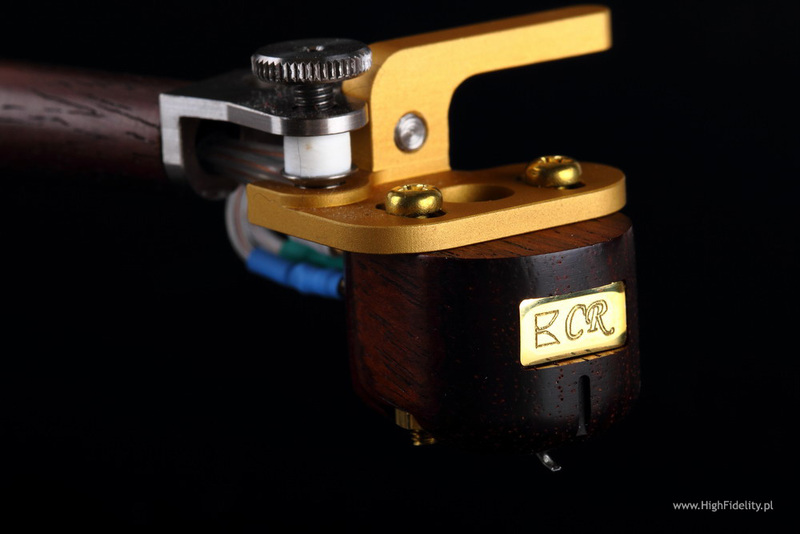 In most cartridges available on the market, the cantilever, where the diamond is mounted on one side and the coil on the other, is fixed to the cartridge with a wire, which fixes it and pushes against the magnet placed behind the coil (Fig. 1). Between the coil and the magnet, there is an absorber, made from elastic material (rubber, silicon). This is not the best solution, because as you can notice on the picture, the axis of the moving elements is not in the middle of the coil, but is shifted to the back. When active, the moving elements need to brake the resistance of the wire, what decreases sensitivity and increases inertia of the suspension. Moreover, the coil wound on an iron core has to overcome additional pulling force generated by the core in a strong magnetic field. 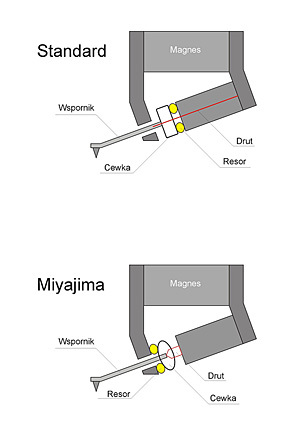 The solution used by Miyajima the cantilever is mounted on a pin extending from the back magnet and is pressed against the front yoke (Fig. 2). Here the absorber is placed between the coil and the front yoke. The visible asset of this solution, is that the fixing point of the cantilever is exactly on the axis of the coil, what allows for a most effective way of transforming oscillation into electric current. This kind of suspension does not introduce additional resistance, and has a much lower inertia. The core of the coil is made from resin, which does not influence the magnetic flux and does not introduce additional distortion. The Jazz Great. Reeds – Part I, EmArcy, MG-36050, LP (mono). Depeche Mode, Fragile Tension/Hole To Feed, Mute, 12BONG42, 2 x 180 g LP. Frank Sinatra, In a Wee Small Hours, Capitol Records/EMI, 688654, 180 g LP (mono). Frank Sinatra, Sinatra&Sextet: Live in Paris, Reprise/Mobile Fidelity, MFSL 1-312, No. 238, 2 x 180 g LP. Frank Sinatra, Sinatra&Strings, Reprise/Mobile Fidelity, MFSL 1-313, No. 199, 180 g LP. J. S. Bach, The Works of Johann Sebastian Bach. IX. Research Period, Archive Production, ARC 3162, LP (mono). Jean-Michel Jarre, Zoolok, Dreyfus Disques/Polygram Canada, JAR 5, LP. Julie London, Julie is her name. Vol.1, Liberty, LRP 3006, LP (mono). Julie London, Tenderly Yours, Guest Star Recordings, G-1417, LP (mono). Louis Armstrong, In Prague. Lucerna Hall 1965, Panton, 8015 0075, LP (mono). Mel Tormé, Mel Tormé at the Red Hill , Atlantic/London Records, HA-K 8021, LP (mono). Mel Tormé, Mel Tormé with The Marty Paich Dek-tette, Bethlehem Recording/London Records, LTZ-N15009, LP (mono). I have no doubts, almost none, that the master for Mr. Miyajima were cartridges from Ortofon SPU series (test of the SPU Synergy A HERE), EMT or something similar. 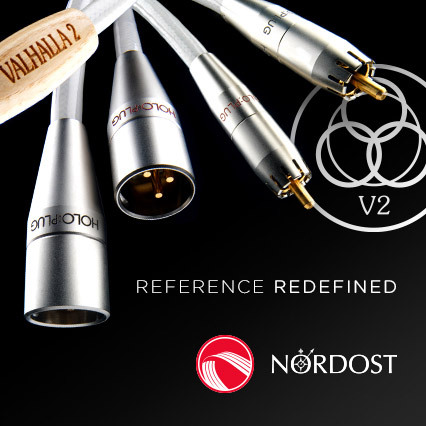 An indirect indicator for this is the high tracking force those cartridges require (suggested VDF for the Waza is 3g), but it was for me enough to listen to any disc, to exactly remember, what I heard with the mentioned Ortofon. The Waza sounds in an incredibly, really incredibly coherent way. The gravity point of the timbre is placed on the midrange, slightly lower, than the 1kHz range. This gives natural boost to the vocals. This is one of the reasons, the vocal of Mel Torme from the disc Mel Tormé Sings Schubert Alley sounded so incredibly natural. I bought this disc recently on ebay for 4USD, an it finally arrived yesterday. It is in mint condition, and furthermore it turned out to be a Japanese pressing – this is what you could call luck. I know this disc from CD, from a Japanese CD, but that, what the Waza achieved with it, was world mastery for me: it played everything in a warm, precise way. The voice of Torme was to the front, it had a warm timbre and large volume. But it did not cover the band, it did not dominate the sound. That would be an error, because on the disc he is accompanied by The Marty Paich Orchestra and it is an equal partner to the artist. Also sound wise. Until now, it could also have been the description of the Ortofon as well… There are more common points, because Miyajima played electronic music (like Oxygene and Zoolook from Jarre) and rock in a very convincing way. But I think, that the Waza differentiates the recordings better.